London has a lot of postal districts. Just taking the London-specific ones (W, NW, N, E, SE, SW, EC and WC), there are 119. And most of these have a good range of pubs, too, though most obviously cluster in the centre of town. Not SE21, though: this postal district we can cover quickly. I now have photos of all three (that’s 3) of its pubs (though there’s one additional former pub still standing). Figure 41. 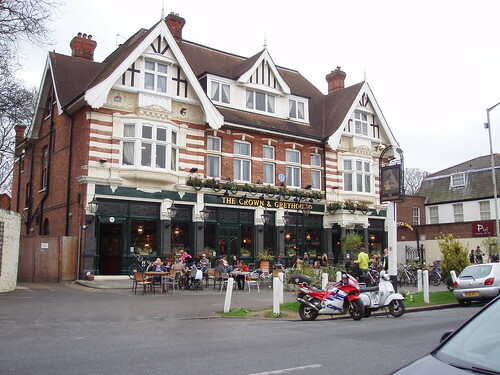 The Crown and Greyhound (Dulwich Village SE21). Another of our postcode round-ups: E5 is in Hackney, specifically Clapton, both Lower and Upper. Pubology has no interest in dwelling on the media fascination of the early part of this century that saw Lower Clapton Road dubbed “Murder Mile” and refuses to perpetuate this journalistic nonsense (strong words, there): it has scant relevance to the E5 of today. As with many areas on the outskirts of central London, Hackney grew up as a country retreat for the harried professional classes. Clapton and Homerton were dominated by large homes and a handful of estates, most of which have long since disappeared and replaced by the more modern form of estate. From what remains of what was once many more establishments in E5, there are still a good variety, both local pubs as you’d expect, but also rather more genteel establishments catering to a growing influx of middle-class residents, pushed further east by the rapid gentrification of Islington in the late-20th century. Figure 27. 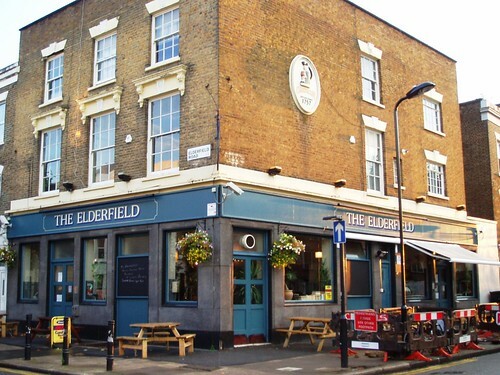 The Elderfield (Lower Clapton E5). 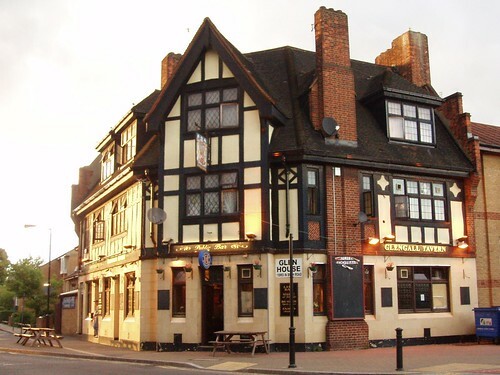 I’ve been making only slow progress on this journal, but have nonetheless decided to introduce a new feature: a survey of the pubs within a postal district. The boundaries of London’s locales are notoriously difficult to pinpoint in all but a few neatly-defined areas (Mayfair, for example), therefore I’m going with the postcode instead. It will be a while before I bite off something huge like W1, but let’s start with somewhere close to home. SE15 mainly covers Peckham, as well as Nunhead to its south. Peckham is neatly divided by Peckham High Street/Queens Road into a northern and southern area. Rye Lane, the main shopping thoroughfare running south from Peckham High Street, also serves to keep the two distinct southern areas apart, with the larger concentration of council estate housing on the eastern side, and a conservation area (the Holly Grove Conservation Area, sometimes referred to by estate agents using the name of its main street, Bellenden Road) to the west. Nunhead is to the south, on either side of the grand Victorian cemetery of that name. Like many comparable conurbations in South-East London, Peckham and Nunhead were originally villages with only a small number of wealthy land-owners on large estates. Upon the coming of the railways in the 19th century, they started to grow as fully-fledged suburban areas, increasingly accommodating the urban poor leaving the centre of the city. As such, throughout the latter part of the 20th century, Peckham has been known for its high crime rate and poor provision of social housing, not helped by inadequate system-built post-war estates (particularly in North Peckham). 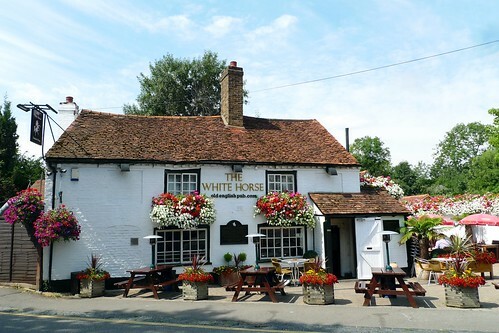 The dominant feature of the drinking landscape is the simple local pub, usually one or two rooms. Some of these are in Victorian buildings, betraying a grander past, while others make lesser claims for attention. Figure 16. Glengall Tavern (North Peckham SE15).